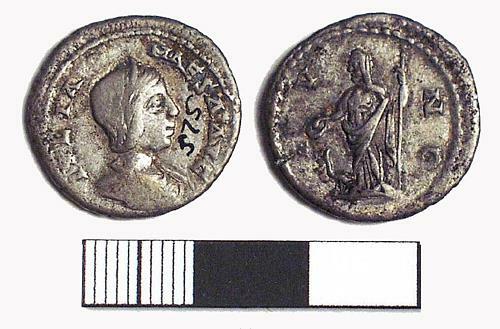 A silver Roman coin (denarius singular, denarii plural). These are about 16 to 18mm in diameter. They were standard issues until the 3rd century AD. They can be distinguished from later Roman 'silver' coins because they contain more silver and are dumpier and thicker. They always show the emperor's head, usually wearing a laurel wreath. Twenty five denarii were worth the same as one aureus.